My specialty is in the area of nanoscience and modern condensed matter physics, exact diagonalization, high temperature superconductivity, quantum computations and magnetism, applications of synchrotron radiations in studies of material characteristics in extreme conditions of interstitial space. I was a Principal Investigator of a number of funding projects in the Institute of Nuclear Physics in Moscow, Institute of Atomic Energy in Yerevan, and was honored in 1991 by a Doctor of Sciences degree. Since 1972 I was working on the problem of high temperature superconductivity in the Lebedev Physics Institute at the Tamm's Department of Theoretical Physics under the supervision of the Nobel Prize Laureate, V. L. Ginzburg. I earned my Ph.D. in 1977 from Lebedev Physics Institute working with Dr. Khomskii and received my B.S./M.S. from Lomonosov University in Moscow, majoring in Physics and Mathematics. From 1984 to 1993 I was a Senior Scientist in the Institute of Atomic Energy in Armenia, where I was responsible for the development of various programs in applications of synchrotron radiation sources for studies of solid state physics, properties of novel high temperature superconductors, electronic phase transitions in rare-earth and transition metal compounds. Since 1984 I was appointed as Professor in General Physics Department at the Armenia University in Yerevan, where I have developed a contemporary educational program and introduced new tutorials and textbooks for graduates in the areas of Quantum Magnetism and Superconductivity. In 1993 I was invited to work in the United States, particularly at Union College (Schenectady, NY) to join the Department of Physics (http://www.union.edu/academic_depts/physics_astronomy/index.php) as a Research Professor. There I developed a theory of orbital ordering and mixed valence states in extreme external conditions (temperature, pressure, composition of material) and studied the finite size effects in small clusters of atoms in the presence of strong magnetic field. Since 1996 I was invited by CSUN to work as a Research Associate in the Material Computational Center where I worked on different projects on electron correlations in solid materials. I have developed theory of electron correlations for accurate calculations of the electronic properties of novel magnetic and superconducting materials. I was working as an Adjunct Professor and Part Time Faculty at the Department of Physics at CSUN and Pierce College, where I was involved in teaching the number of lecture courses and laboratory sessions in general physics. Also at CSUN I was pursuing my research work in theoretical and computational physics in collaboration with my colleagues, Dr. C. Yang, You-Ling Chiang at the Tamkang University in Taiwan by applying newly developed many body self-consistent perturbation theory beyond the existing self-consisting theories for studies of Fermi and Luttinger liquids, high temperature superconductivity, the BCS-Bose condensation crossover, etc. Since 2006 I started to teach physics courses and purue my research work at the Department of Physics and Astronomy in California State University, Los Angeles (CSULA). My most recent research in area of nanoscience with my colleagues Dr. G. Fernando and K. Palandage from University of Connecticut and Dr. J. Davenport in Brookhaven Natioonal Laboratory is on electron pairing and formation of various types of magnetic correlations for ensembles of small clusters of different geometries are studied with emphasis on tetrahedrons and square pyramids under variation of interaction strength, electron doping and temperature. These exact calculations of charge and spin collective excitations and pseudogaps yield intriguing insights into level crossing degeneracies, phase separation and condensation. Obtained coherent and incoherent pairings provide a route for possible superconductivity different from the conventional BCS theory. Criteria for spin-charge separation, reconciliation and recombination driven by interaction strength, next-nearest coupling and temperature are found. Resulting phase diagrams resemble a number of inhomogeneous, coherent and incoherent nanoscale phases seen recently in high-Tc cuprates, manganites and colossal magnetoresistive (CMR) nanomaterials. I have around 30 years of professional experience in the area of Applied and Theoretical Physics, Material Sciences and have published more than 100 papers in refereed scientific periodicals. Awarded from the Strathmore's Who's Who publications Board, 2003/2004. Awarded from the New York University, New York, 1994. Granted from the Union College, Schenectady, New York, 1993. Honored from the American Physical Society, New York, 1993. Armen N. Kocharian is known through his contributions in varies fields of condensed matter physics, strongly correlated electrons in high TC superconductors, quantum magnetism and mixed valence states, spin dependent transport and light transmission in multilayered nanostructures. His recent accomplishments in nanomaterials and nanophotonics include local electron pairing, electron instabilities and unconventional superconductivity in inhomogeneous systems, spin orbital effects and magnetism in carbon based nanomaterials, critical behavior of strong earthquakes. 1. K. Fang, G. W. Fernando, A. N. Kocharian, Local electronic nematicity in the two-dimensional one-band Hubbard model, to be published in J. Phys. : Condens. Matt. (2013). 2. K. Fang, G. W. Fernando, A. N. Kocharian, Pairing enhancement in Betts lattices with next nearest neighbor couplings: Exact results, Physics Letters A 376, 538-543 (2012). 3. K. Palandage, K. Fang, G. W. Fernando, A. N. Kocharian, Tracing magnetism and pairing in FeTe-based systems, Journal of Material Science, V 47, 7671-7677 (2012). 4. A. H. Gevorgyan and A. N. Kocharian, Photonic density and nonreciprocal optical properties in chiral liquid crystals, Optics Communications, 285, 2854-2863 (2012). 5. A. N. Kocharian, K. Fang, G. W. Fernando, Phase separation instabilities in Betts Hubbard nanoclusters, Journal of Magnetism and Magnetic Material, 324, 3427–3431 (2012). 6. N. S. Ananikian, L. N. Ananikyan, L. A. Chakhmakhchyan and A. N. Kocharian, Magnetic properties and thermal entanglement on a triangulated Kagom'e lattice, J. Phys. A: Math. Theor. 44, 025001 (2011). 7. N. S. Ananikian, L. N. Ananikyan, L. A. Chakhmakhchyan and A. N. Kocharian, Thermal entanglement and critical behavior of magnetic properties on a triangulated Kagom'e lattice, Acta Polytechnica 51 7 (2011). 8. V. S. Abgaryan, N. S. Ananikian, L. N. Ananikyan, and A. N. Kocharian, Phase transitions and entanglement properties in spin-1 Heisenberg clusters with single-ion anisotropy, Phys. Scr. 83, 055702 (2011). 9. A. N. Kocharian, A.S. Sahakyan, and R. M. Movsesyan, Tunneling properties of heterostructures with a double magnetic barrier, Armenian Journal of Physics 3 297 (2010). 10. A. N. Kocharian, A.S. Sahakyan, and R. M. Movsesyan, Spin-polarizing properties of heterostructures with magnetic nano elements, Journal of Magnetism and Magnetic Materials 322, L42-L48 (2010). 11. A. N. Kocharian, G. W. Fernando, C. Yang, Spin and charge pairing instabilities in nanoclusters and nanomaterials pairing, Review chapter 15 in Scanning probe microscopy in nanoscience and nanotechnology, Ed. B. Bhushan, Springer, pp. 507-570 (2010). 12. A. N. Kocharian, G. W. Fernando, K. Palandage, and J. W. Davenport, Spin-charge separation and electron pairing instabilities in Hubbard nanoclusters, Ultramicroscopy 109, pp. 1066-1073 (2009). 13. G.W. Fernando, K. Palandage, A. N. Kocharian, and J. W. Davenport, Pairing in bipartite and non-bipartite repulsive Hubbard clusters: Octahedron, Phys. Rev. B 80, pp. 014525-1 014525-7 (2009). 14. A. N. Kocharian, G. W. Fernando, K. Palandage, and J. W. Davenport, Charge and spin pairing instabilities in Hubbard nanoclusters, Solid State Phenomena V. 152-153, pp. 583-586 (2009). 15. A. N. Kocharian, G. W. Fernando, K. Palandage, and J. W. Davenport, Electron coherent and incoherent pairing instabilities in inhomogeneous bipartite and nonbipartite nanoclusters, Physics Letter A 373, pp. 1074-1082 (2009). 16. A. N. Kocharian, G. W. Fernando, K. K. Palandage, and J. W. Davenport, Coherent and incoherent pairing instabilities and spin-charge separation in bipartite and nonbipartite nanoclusters: Exact results, Phys. Rev. B 78, pp. 075431-1– 075431-7 (2008). 17. A. N. Kocharian, G. W. Fernando, K. K. Palandage, T. Wang and J. W. Davenport, Exact thermodynamics of pairing and charge-spin separation crossovers in Small Hubbard Nanoclusters, Phys. Lett. A 364, 57–65 (2007). 18. G. W. Fernando, A. N. Kocharian, K. K. Palandage, T. Wang and J. W. Davenport, Phase separation and electron pairing in repulsive Hubbard clusters, Phys. Rev. B 75, pp. 085109-1 – 085109-5 (2007). 19. A. H. Gevorgyan, A.A. Grigoryan, A. Zh. Khachataryan, A. N. Kocharian, L. O. Mikhaelyan, A. M. Sedrakyan, G. A. Vardanyan, Polarization plane’s weak rotation amplifiers and polarization azimuth stabilizers, Optik 117, pp. 309-316 (2006). 20. A. H. Gevorgyan, A. N. Kocharian, G. A. Vardanyan, Accumulation and transmission of the light energy in nonreciprocal multilayer systems, Optics Comm. 259, pp. 455 (2006). 21. K. Palandage, G. Fernando, A. N. Kocharian and J. W. Davenport, An exact study of pairing fluctuations and phase diagrams in four-site Hubbard Nanoclusters, J. Comput.-Aided. Mater. Des. 14 103-107 (2006). 22. A. N. Kocharian, G. W. Fernando, K. K. Palandage and J. W. Davenport, Exact study of charge-spin separation, pairing fluctuations, and pseudogap in four-site Hubbard clusters, Phys. Rev. B 74, pp. 024511-1 (2006). 23. A. N. Kocharian, G. W. Fernando, K. Palandage and J. W. Davenport, Thermodynamic properties, magnetism and Mott-Hubbard like transitions in nanoscale clusters, Journal of Magnetism and Magnetic Materials 300, e585 (2006). 24. A. H. Gevorgyan, M. Z. Harutyunyan, A. N. Kocharian, et al., Selective diffraction reflection in helical periodical media with large anisotropy, Mol. Cryst. Liq. Cryst., Vol. 432, pp. 67–80 (2005). 25. C. Yang, A.N. Kocharian, Y.L. Chiang and T. Y. Chou, Perturbation theory about self-consistent field solution in one-dimensional Hubbard model, International Journal of Modern Physics B 19, pp. 2225-2249 (2005). 26. T. Abe, R. Seki, A. N. Kocharian, Erratum: Mean field calculation of thermal properties of simple nucleon matter on a lattice, Phys. Rev. C 71, 059902 (E) (2005). 27. T. Abe, R. Seki, A. N. Kocharian, Mean field calculation of thermal properties of simple nucleon matter on a lattice, Phys. Rev. C 70, pp. 014315-1 - 014315-12 (2004). 28. A. N. Kocharian, C. Yang, Y. L. Chiang and T. Y. Chou, Exact and self-consistent results in one-dimensional repulsive Hubbard model, International Journal of Modern Physics, B17, pp. 5749-5769 (2003). 29. A. N. Kocharian, C. Yang, Y. L. Chiang and T. Y. Chou, Perturbation theory about self-consistent field solution in one-dimensional Hubbard model, International Journal of Modern Physics B17, pp. 3363-3366 (2003). 30. C. Yang, A. N. Kocharian and Y. L. Chiang, Thermodynamic properties of one-dimensional Hubbard Model at finite temperature, International Journal of Modern Physics B17, pp. 3354-3358 (2003). 31. A. N. Kocharian, C. Yang and Y. L. Chiang, Superconductivity, magnetism and mapping between the attractive and repulsive Hubbard models; Journal Physics Society of Japan, 71, pp. 223-224 (2002). 32. C. Yang, A. N. Kocharian and Y. L. Chiang; Phase diagram and magnetic correlations in one-dimensional Hubbard model with magnetic field, Journal Physics Society of Japan, 71, pp. 193-195 (2002). 33. C. Yang, A. N. Kocharian and Y. L. Chiang, Induced magnetization and inhomogeneous superconductivity in presence of external magnetic field, Physica C364-365, pp. 155-157 (2001). 34. A. N. Kocharian, C. Yang, Y .L. Chiang, Phase diagram and BCS-Bose condensation crossover in 1D and 2D Hubbard models, Physica. C 364-365, pp. 131-133 (2001). 35. A. N. Kocharian, C. Yang, Y. L. Chiang, Pairing, crossover and inhomogeneous superconductivity in attractive Hubbard model, Int. J. Mod. Phys. B 14, pp. 3514-3519 (2001). 36. A. N. Kocharian, N. K. Kioussis, S. Park, Magnetic crossover in one-dimensional Hubbard model in the presence of magnetic field, J Phys. : Condens. Matt. 13, pp. 6759-6772 (2001). 37. C. Yang, A.N. Kocharian, Y. L. Chiang, Phase transitions and exact ground-state properties of the one-dimensional Hubbard model in a magnetic field, J. Phys: Condens. Matter 12, pp. 7443-7454 (2000). 38. G. W. Fernando, R. E. Watson, M. Weinert, A. N. Kocharian, A. Ratnaweera and K. Tennakone, Magnetic moment of iron in metallic environments, Physical Review B 61, pp. 375-381 (2000). 39. A. N. Kocharian, C. Yang, Y. L. Chiang, The phase diagram and inhomogeneous superconductivity in the one-dimensional attractive Hubbard model, Physica C 341-348, pp. 253-254 (2000). 40. C. Yang, Kocharian, Y.L. Chiang, Exact magnetic ground state properties of the one-dimensional Hubbard model, Physica C 341-348, pp. 245-246 (2000). 41. A. N. Kocharian, C. Yang, Y. L. Chiang, Bose condensation and electron pairing in one-dimensional Hubbard model, Inter. J. Mod. Phys. B 29-31, pp. 3538-3545 (1999). 42. C. Yang, A.N. Kocharian, Y. L. Chiang, Exact ground-state properties of one-dimensional Hubbard model in the presence of magnetic field, Inter. J. Mod. Phys. B 29-31, pp. 3573-3577 (1999). 43. C. Yang, A. N. Kocharian and Y. L. Chiang, Exact magnetic phase diagram of the one-dimensional Hubbard model, Physica B 281-282, pp. 831-833 (2000). 44. A. K. Jermakian, A. N. Kocharian, A. S. Saakian, Mott-Hubbard crossover in two-dimensional clusters threaded by a magnetic field, Physica B 281-282, pp. 821-822 (2000). 45. A. N. Kocharian, C. Yang, Y. L. Chiang, N. Kioussis, Crossover in the attractive Hubbard model for general electron concentrations, Physica B 259-261, pp. 739-741 (1999). 46. A. N. Kocharian, C. Yang, Y. L. Chiang, Self-consistent and exact studies of pairing correlations and crossover in attractive one-dimensional Hubbard model, Physical Review B 59, pp. 7458-7472 (1999). 47. C. Papatriantafillou, N. Kioussis, S. Park, A. N. Kocharian, The one-dimensional periodic Anderson model: a mean field study, Physica B 259-261, pp. 208-209 (1999). 48. A. N. Kocharian, A. Saakian, Electron state confinement in a Hubbard chain, Phys. Solid State 40, pp. 701-703 (1998). 49. A. N. Kocharian, A. Saakian, Two-particle correlations in 1d-lattice systems with d-interactions, Phys. Solid State 40, pp. 336-340 (1998). 50. A. N. Kocharian, A.K. Jermakian, A. S. Saakian, Finite-size clusters in discrete Hubbard model with transverse and longitudinal magnetic fields, Physica B 259-261, pp. 736-738 (1999). 51. J. Szeftel, H. Moudden and A. N. Kocharian, On the physical significance of the high-dimensional Bethe-ansatz, Journal of Magnetism and Magnetic Materials 187, pp. 261-267 (1998). 52. N. K. Kioussis, A.N. Kocharian, S. Park, One-dimensional Hubbard model in the presence of magnetic field, Journal of Magnetism and Magnetic Materials, 177-181, pp. 575-576 (1998). 53. G. W. Fernando, A. N. Kocharian, Stoner criterion of ferromagnetism and moment saturation in the Hubbard model with applied magnetic field, Physica B 230-232, pp. 509-512 (1997). 54. A. N. Kocharian, C. Yang, Y.L. Chiang, The superconductivity of two holes near half-filling in attractive two-component Hubbard model, Physica B 230-232, pp. 918-921 (1997). 55. A. N. Kocharian, The behavior of the critical magnetic field and correlation functions in finite-size Hubbard-like models. Book Chapter: In Series on Advances in Statistical Mechanics, ed. C. King, F.Y. Wu, World Scientific Publishing Company, v 13, p. 147, (1997). 56. A. N. Kocharian, A. K. Jermakian, C. Yang, Off-diagonal superconducting correlations and Nagaoka instability in the repulsive Hubbard model, Physica B 230-232, pp. 466-468 (1997).A. N. Kocharian, A. K. Jermakian, A. S. Sogomonian, Mott-Hubbard transition in finite one and two-dimensional lattices: exact results, Physica B 230-232, pp. 1031-1033 (1997). 57. A. N. Kocharian, G. R. Reich, Orbital magnetism and valence instabilities in narrow bands, IEEE Transactions on Magnetics, v 33, No. 1, pp. 682-685, (1997). 58. A. N. Kocharian, J. H. Sebold, Finite-size effects and unsaturated ferromagnetism of two-component Hubbard rings in a strong magnetic field: exact results, Physical Review B 53, pp. 12804-12812 (1996). 59. A. N. Kocharian, A. K. Jermakian and A.S. Sogomonian, Mott-Hubbard transition in finite 1d and 2d lattices, Workshop on Strong Electron Correlations, Preprint IC/96/277, ICTP, Miramare-Trieste, Italy, (1996). 60. A. N. Kocharian and C. Yang, Superconductivity in two-band model with strong attraction, Applied Superconductivity, v 2, pp. 661-665, 1995. 61. A. N. Kocharian and G. R. Reich - "High temperature superconductivity in the generalized negative U Hubbard model" Journal of Materilas Chemistry and Physics B 2, pp. 134-137, 1995. 62. A. N. Kocharian and G. R. Reich, Phase transitions in generalized Hubbard model, Physica B 206-207, pp. 719-722, 1995. 63. A. N. Kocharian and G. R. Reich, Two-particle correlations in finite low-dimensional Hubbard-like lattices, Physica B 206-207, pp. 732-735, 1995. 64. A. N. Kocharian and A. S. Sogomonian, Correlation decay in low dimensional spin glasses, Journal of Applied Physics, 76, pp. 6186-6188, 1994. 65. A. N. Kocharian and G. R. Reich, Mixed valence in generalized Hubbard model, Journal of Applied Physics, 76, pp. 6127-6129, 1994. 66. A. N. Kocharian and A. S. Saakian, Valence fluctuation and phase transitions in system of strongly interacting fermions, Physica B 199-200, pp. 582-584, 1994. 67. A. N. Kocharian and A. G. Sogomonian, Phase diagram and correlation decay of bipolarons in 2d lattices, Physica B 194-196, pp. 445-447, 1994. 68. A. N. Kocharian and P. S. Ovnanian, High temperature superconductivity and mixed valence state of bipolarons, In Phonon Scattering in Condensed Matter VII, Springer Series in Solid-State Sciences No. 112, v 8, pp. 202-203, eds. M. Meisner and R. O. Pohl, Springer, Verlag, Heidelberg, 1993. 69. A. N. Kocharian and P. S. Ovnanian, Electron and hole superconductivity in model of local pairs near half filling, Physica C 185-189, pp. 1737-1738, 1991. 70. A. N. Kocharian, Cooperative effects in the system of strongly correlated electrons, Abstracts of the highest academic degree (Doctor of Science, D.Sc.) thesis, Institute of Atomic Energy, Yerevan, Armenia, 24 p., 1991. 71. A. N. Kocharian and P. S. Ovnanian, Charge fluctuations in non-perturbative Hubbard model, Sov. Journal of Low Temperature Physics, v 17, pp. 551-552, 1991. 72. A. N. Kocharian and P. S. Ovnanian, Electron correlations in the effective Hubbard model", Zeitschrift fur Physik B: Condensed Matter, v 83, pp. 61-64, (1991). 73. V. E. Adamian, A. A. Artsruni, A. Benayssa, A. N. Kocharian, M. A. Melikian, A.G. Toneyan, Magnetic properties of model multicomponent compounds with CsCl structure, Physica Status Solidi, B 156, pp. 633-640, 1989. 74. A. N. Kocharian, X-ray absorption spectra theory in variable valence compounds, Journal of Magnetism and Magnetic Materials, v 63-64, pp. 499-501, 1987. 75. A. N. Kocharian, Doublet structure of X-ray spectra and final state interactions in variable valence compounds, Sov. Phys. JETP Lett., v 45, pp. 102-104, 1987. 76. A. N. Kocharian, Change of valence in rare earth semiconductors in the multi-impurity Anderson model, Sov. Phys. Solid State, v 28, pp. 6-10, 1986. 77. A. N. Kocharian, Interaction of localized electrons in crystals, J. Low. Temp. Phys. v 9, pp. 399-341, 1983. 78. A. N. Kocharian and N. Sh. Izmailian, Phase transitions in the two-level model: exact solution, Solid State Communications, v 44, pp. 805-808, 1982. 79. A. N. Kocharian, P. S. Ovnanian and D. I. Khomskii, Variable f-level width and valence change transitions in the cerium compounds, JETP Lett., v 34, No. 1, pp. 23-25, 1981. 80. A.N. Kocharian, States with intermediate valence in rare earth metals and semiconductors, (Review article) National Journal of Chemical Society, v 6, pp. 39-58, 1981. 81. N. Sh. Izmailian, A. N. Kocharian, P. S. Ovnanian and D. I. Khomskii, Mixed valence in periodic Anderson lattices, Sov. Phys. Solid State, v 23, pp 1736-1739, 1981. 82. A. N. Kocharian and P. S.Ovnanian, Electron structure and the mechanism of indirect exchange in doped semiconductors, Sov. Phys. Solid State, v 21, pp. 997-999, 1979. 83. A. N. Kocharian and P. S. Ovnanian, Exchange interaction mechanism in magnetic superconductors, Sov. Phys. JETP v 47, pp. 326-330, 1978. 84. A. N. Kocharian, Effect of doping on mechanism of exchange interaction in magnetic semiconductors, Sov. Phys. Lebedev Inst. Rep. No. 2, pp. 1-6, 1977. 85. A. N. Kocharian, Electron structure and properties of substances with localized and collectivized electrons. Abstracts of the Philosophy Doctorate Thesis, Lebedev Physics Institute. Moscow, Russia, 20 p., 1977. 86. D. I. Khomskii and A. N. Kocharian, Virtual levels, mixed valence phase and transitions in rare-earth compounds, Solid State Communications, v 18, pp. 985-989 1976. 87. A. N. Kocharian and D. I. Khomskii, On electron phase transitions with valence change in rare-earth compounds, Sov. Phys. JETP, v 44, pp. 404-409, 1976. 88. A. N. Kocharian, P. S. Ovnanian and D. I. Khomskii, Exchange interactions in magnetic semiconductors, Sov. Phys. Solid State, v 17, 290, 1975. 89. 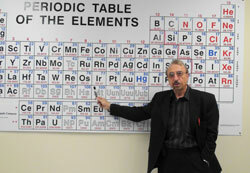 A. N. Kocharian and D. I. Khomskii, Effect of hybridization on electron transitions in rare-earth compounds, Sov. Phys. Lebedev Inst. Rep., No. 8, pp. 1-7, 1974. 90. A. N. Kocharian and D. I. Khomskii, The influence of the unfilled narrow band on the superconductivity of transition and rare-earth metals, Sov. Phys. Solid State, v 14, No. 8, pp. 2093-2095, 1973. 1. A. N. Kocharian, K. Fang, G. W. Fernando, A. V. Balatsky, K. Palandage , Phase separation instabilities and pairing in layered BSCCO-like lattice geometries, APS March Meeting, Baltimore, MD (2013). 2. K. Fang, G. W. Fernando, A. V. Balatsky, A. N. Kocharian, K. Palandage, Two-dimensional Hubbard model on a honeycomb lattice, APS March Meeting, Baltimore, MD (2013). 3. A. Sahakyan, R. Movsesyan, A. N. Kocharian, Electron energy spectra in two dimensional quantum rings consisting of two nanoelements, APS March Meeting, Baltimore, MD (2013). 4. S. Ts. Akopian, A. N. Kocharian, The time evolution of seismic systems and non-equilibrium dynamics in ensemble of strong earthquakes, European Seismological Commission 33-rd General Assembly Moscow, Russia (2012). 5. A. N. Kocharian, K. Fang, G. W. Fernando, Electron pairing instabilities and magnetic properties in nanoclusters and nanomaterials, Tech Connect World 2012, Santa Clara, CA (2012). 6. A. N. Kocharian, K. Fang, G. W. Fernando, K. Palandage, A.V. Balatsky, Phase separation instabilities and modulated coherent pairing states in Bi-based cuprates, Annual Meeting of the California-Nevada Section of the APS, San Luis Obispo, CA (2012). 7. K. Palandage, G. W. Fernando, A. N. Kocharian, Magnetism and superconductivity in modulated FeTe systems, APS March Meeting, Boston, MA (2012). 8. A. N. Kocharian, K. Fang, G. W. Fernando, K. Palandage, A. V. Balatsky, Phase separation instabilities and pairing modulations in Bi2Sr2CaCu2O8+d, APS March Meeting, Boston, MA (2012). 9. K. Fang, G. W. Fernando, A. N. Kocharian, Local electronic nematicity in the 2-dimensional Hubbard model, APS March Meeting, Boston, MA (2012). 10. A. N. Kocharian, G. W. Fernando, K. Fang, Electron and magnetic instabilities in Betts lattices with next nearest neighbors: exact results, 2011 Annual Meeting of the California-Nevada Section of the APS, SLAC National Accelerator Laboratory, Menlo Park (2011). 11. A. N. Kocharian, G. W. Fernando, K. Palandage, Phase separation instabilities, coherent pairing and condensation in Hubbard nanoclusters, Moscow International Symposium on Magnetism (MISM), Lomonosov State University, Moscow (2011). 12. K. Palandage, G. W. Fernando, A.V. Balatsky, A. N. Kocharian, Comparative exact studies of similarities and differences in attractive and repulsive Hubbard models, Moscow International Symposium on Magnetism (MISM), Lomonosov State University, Moscow (2011). 13. A. N. Kocharian, G. W. Fernando, A. V. Balatsky, Microscopic modulation of coherent pairing gap in Bi2Sr2CaCu2O8+a, Conference on Seeing at the Nanoscale 2011, University of California, Santa Barbara (2011). 14. A. N. Kocharian, G. W. Fernando, A. V. Balatsky, Effect of electron pairing instabilities and superlattice modulation on coherent electron pairing in Bi2Sr2CaCu2O8+a, Conference New3SC-8 of Centennial Anniversary of Superconductivity, Chongqing, China (2011). 15. N. Kocharian, G. W. Fernando, A. V. Balatsky, Microscopic modulation of the coherent pairing gap in Bi2Sr2CaCu2O8+a, Seeing at the Nanoscale 2011 - Proceedings of conference Exploring the future of Nanotechnology using AFM and related technologies, UC Santa Barbara (2011). 16. N. Kocharian, G. W. Fernando, K. Fang, Exact calculations of phase separation instabilities and pairing in two-dimensional Betts nanoclusters, APS March Meeting, Dallas, TX (2011). 17. K. Fang, A. N. Kocharian, G. W. Fernando, Electron paring instabilities in 8-site Betts lattice: exact result, APS March Meeting, Dallas, TX (2011). 18. K. Fang, G. W. Fernando, A. N. Kocharian, Coherent pairing and phase separation in small negative U Hubbard nanoclusters away from half filling, APS March Meeting, Dallas, TX (2011). 19. A. N. Kocharian, A. S. Sahakyan, and R. M. Movsesyan, Spin-polarization and transmission properties in heterostructures with magnetic nano elements, APS March Meeting, Dallas, TX (2011). 20. N. Kocharian, G. W. Fernando and Kun Fang, Phase separation instabilities in two-dimensional Betts clusters: exact results, Annual Meeting of the California-Nevada Section of the APS, Caltech, Beckman Institute Auditorium (2010). 22. N. Kocharian, K. Palandage, G. W. Fernando and J. W. Davenport, Electron conductivity and pairing instabilities in small frustrated nanoclusters, APS March Meeting, Portland, OR (2010). 25. K. Palandage, G. W. Fernando, J. W. Davenport, D. I. Khomskii, A. N. Kocharian, Electron conductivity and pairing instabilities in small frustrated nanoclusters, APS March Meeting, Portland, OR (2010). 26. N. Kocharian, N. Ananikyan, L. Ananikian, V. Abgaryan, Negativity and phase transitions in Spin-1 anisotropic Heisenberg model with Longitudinal Crystal Field, APS March Meeting, Portland, OR (2010). 27. A. N. Kocharian, G. W. Fernando, K. Palandage and J. W. Davenport, Spin-charge separation instabilities and pairing in Hubbard nanoclusters, ISPM Seattle'08 conference proceedings, to be published in Ultramicroscopy, Seattle WA (2009). 28. A. N. Kocharian, G. W. Fernando, K. Palandage and J. W. Davenport Exact calculations of magnetic and pairing instabilities in Hubbard nanoclusters, Gordon Conference, Mount Holyoke College, MA (July 2009). 29. A. N. Kocharian, G. W. Fernando, K. Palandage and J. W. Davenport, Charge and spin pairing instabilities in Hubbard nanoclusters, MISM Moscow'08 conference proceedings, in Material Science Forum, Moscow, Russia (2009). 30. A. N. Kocharian, G. W. Fernando, K. Palandage and J. W. Davenport, Electron charge and spin pairing pseudogaps and Nagaoka instabilities in nanoclusters, submitted to APS March Meeting, New Orleans, LA (2008). 31. A. N. Kocharian, G. W. Fernando, Kalum Palandage and J. W. Davenport, Exact thermodynamics of phase separation and pairing in Hubbard nanoclusters, submitted to APS March Meeting, New Orleans, LA (2008). 32. A. N. Kocharian, G. W. Fernando, K. Palandage and J. W. Davenport, Exact thermodynamics of electron pairing and ferroelectricity in attractive Hubbard nanoclusters, submitted to APS March Meeting, New Orleans, LA (2008). 33. A. N. Kocharian, G. W. Fernando, K. Palandage and J. W. Davenport, Electron charge pairing and Nagaoka spin instabilities in nanoclusters, submitted to APS March Meeting, New Orleans, LA (2008). 34. A. N. Kocharian, L. N. Ananikyan, S. Pogosyan, N. Ananikyan, Statistical mechanics and thermodynamics in anisotropic Heisenberg-like nanoclusters, submitted to APS March Meeting, New Orleans, LA (2008). 35. K. Palandage, G. W. Fernando, A. N. Kocharian and and J. W. Davenport, Electron pairing in small Hubbard nanoclusters, submitted to APS March Meeting, New Orleans, LA (2008). 36. A. N. Kocharian, G. W. Fernando, and K. Palandage, Exact Thermodynamics, Quantum Phase Separation, Crossovers and Entanglement Scaling in Small Size Hubbard Nanoclusters, accepted Towards Functional Nanomaterials: Synthesis, Characteristics and Application, Orlando, FL (2007). 37. A. N. Kocharian, G. W. Fernando, K. Palandage, T. Wang and J. W. Davenport, Phase separation and electron pairing in repulsive Hubbard model, submitted to APS March Meeting, Denver, CO (2007). 38. A. N. Kocharian, G. W. Fernando, T. Wang, K. Palandage and J. W. Davenport, Exact thermodynamics and charge spin separation in Hubbard nanoclusters, submitted APS March Meeting, Denver, CO (2007). 39. Y. L. Chiang, A. N. Kocharian, N. Ananikian, C. Yang, Stataistical quantum entanglement in anisotropic Heisenberg models, submitted to APS March Meeting, Denver, CO (2007). 40. A. N. Kocharian, G. W. Fernando, K. Palandage and J. W. Davenport, Phase diagrams, crossovers and charge-spin separation in small clusters, APS March Meeting, Baltimore, MD (2006). 41. A. N. Kocharian, C. Yang and Y. L. Chiang, Superconductivity and magnetism in small attractive and repulsive Hubbard clusters, APS March Meeting, Baltimore, MD (2006). 42. A. N. Kocharian, G. W. Fernando, J. W. Davenport and Kalum Palandage, Thermodynamic properties, magnetism and Mott-Hubbard-like transition and in nanoscale clusters, Moscow International Symposium on Magnetism, Books of Abstracts, 30TL-C-1, p. 624 Moscow, Russia (2005). 43. A. N. Kocharian, G. W. Fernando and J. W. Davenport, Mott-Hubbard type transition and thermodynamic properties in nanoscale clusters, APS March Meeting, Bulletin Part 2, p. 1217 Los Angeles, CA (2005). 44. A. N. Kocharian, C. Yang and Y. L. Chiang, Regular perturbation theory about generalized self-consistent field Hamiltonian, APS March Meeting, Bulletin Part 2, p. 1214 Los Angeles, CA (2005). 45. G. A. Vardanyan, A. H. Gevorgyan, A. Kocharian, Zh. B. Khachatryan, and S. A. Mkhitaryan, Polarization plane's weak rotation amplifiers and polarization azimuth stabiliziers, Proceedings of SPIE - The International Society for Optical Engineering, Volume 5758, 2005, pp. 345-355. SPIE Conference on optics and photonics, San Diego, CA (2005). 46. A. N. Kocharian, C. Yang and Y. L. Chiang, Converging perturbation theory about self-consistent field solution, APS March Meeting, Montreal, Quebec, Bulletin, abstract # A24.006 Canada (2004). 47. A. N. Kocharian, C. Yang and Y. L. Chiang, BCS-Bose Condensation and crossover from itinerant into localized magnetism in 1D and 2D Hubbard lattices, APS March Meeting, Bulletin, Baltimore, MD (2004). 48. A. G. W. Fernando, J. W. Davenport, and A. N. Kocharian, Quantum Monte Carlo studies of small clusters, APS March Meeting, Bulletin, Baltimore, MD(2004). 49. A. N. Kocharian, C. Yang and Y. L. Chiang - Exact and self-consistent perturbation calculations of thermodynamic properties in correlated electrons in half-metallic materials, Ninth International Conference on Composites Engineering, ICCE/9, Conference, San Diego, CA (2002). 50. A. N. Kocharian, Exact and Self-Consistent Studies of the Ground state properties for 1d and 2d Hubbard Mmodels in entire parameter space, Gordon Research Conference, Colby College Waterville, ME (2002). 51. A. N. Kocharian, Inhomogeneous Superconductivity and BCS-Bose condensation crossover in attractive one-dimensional Hubbard model, Gordon Research Conference, Colby College Waterville, ME (2002). 52. A. N. Kocharian, C. Yang and Y. L. Chiang, Superconductivity and magnetism and mapping between the attractive and repulsive Hubbard models, International Conference on Strongly Correlated Electrons with orbital degrees of freedom, (ORBITAL2001), Japan, Osaka (2001). 53. A. N. Kocharian, C. Yang and Y. L. Chiang, Phase diagram and magnetic correlations in one dimensional repulsive Hubbard model with magnetic field, International Conference on Strongly Correlated Electrons with orbital degrees of freedom, (ORBITAL2001), Japan, Osaka (2001). 54. A. N. Kocharian, C. Yang, Y. L. Chiang, International Conference on New Theories, Discoveries and Applications of Superconductivity and Related Materials, (New3SC-3), "Phase diagram and BCS-Bose condensation of local pairs in 1d and 2d Hubbard model" Honolulu, HI (2001). 55. A. N. Kocharian, C. Yang, and Y. L. Chiang, In Book proceedings of the 8th Asia-Pacific Physics Conference, Electron pairing and stability of inhomogeneous superconducting state in one dimensional attractive Hubbard model, World Scientific Publishing Co, Pte. Ltd, Ed. by Yeong-Der Yao, Hai-Yang Cheng, Chia-Seng Chang, p718 (2000). 56. C. Yang, A. N. Kocharian, and Y. L. Chiang, In Book proceedings of the 8th Asia-Pacific Physics Conference, Exact spin and charge susceptibilities in one dimensional attractive Hubbard model, World Scientific Publishing Co, Pte. Ltd, Ed. by Yeong-Der Yao, Hai-Yang Cheng, Chia-Seng Chang, p721 (2000). 57. A. N. Kocharian, C. Yang, Y. L. Chiang, International Conference on Materials and Mechanisms of Superconductivity High Temperature Superconductors VI, "Inhomogeneous Superconductivity in 1d Attractive Hubbard Model”, Houston, TX (2000). 58. A. N. Kocharian, C. Yang, Y. L. Chiang, The 6th International Conference on Materials and Mechanisms of Superconductivity And High Temperature Superconductors (M2S-HTSC-VI), Feb 20 - 25, NSC-89-2112-M-032-010 Houston, TX (2000). 59. A. N. Kocharian, C. Yang, Y. L. Chiang, The 3rd International Conference on Stripes and High Tc Superconductivity (Stripes 2000), Sep 24-30, Rome, Italy, NSC-90-2112-M-032-003, (2000). 60. A. N. Kocharian, C. Yang, Y. L. Chiang, II Conference on New Theories, Discoveries and Applications of Superconductivity and Related Materials, (New3SC-2), Bose condensation and electron pairing in 1d Hubbard model, Las Vegas, NV (1999). 61. A. N. Kocharian, C Yang, Y. L. Chiang, The 1999 International Conference on Strongly Correlated Electron Systems (SCES'99), Nagano, Japan. NSC88-2112-M032-011 (1999). 62. A. N. Kocharian, C. Yang, Y. L. Chiang, Crossover in attractive Hubbard model for general electron concentrations, -International Conference on Strongly Correlated Electron Systems, Paris, France (1998). 63. Papatriantafillou, N. Kioussis, S. Park, A. N. Kocharian, Phase Diagram of the Symmetric and Asymmetric one-dimensional Anderson model. –International Conference on Strongly Correlated Electron Systems, Paris, France (1998). 64. Papatriantafillou, N. Kioussis, S. Park, A. N. Kocharian, Phase diagram of the symmetric and asymmetric one-dimensional Anderson model, Bulletin of APS, 43, No. 1, K31 7, p 402, Los Angeles, CA (1998). 65. N. Kioussis, A. N. Kocharian, Ground-state properties of the Hubbard model in the presence of magnetic field, APS March Meeting, Bulletin of APS, 42, No. 1, p 814, Kanzas City, Missouri (1997). 66. A. N. Kocharian, C. Yang, Superconductivity in two component fermion system with attraction, APS March Meeting, Bulletin of APS, 42, No. 1, p 428, Kanzas City, MO (1997). 67. A. N. Kocharian, A. K. Jermakian, A. S. Sogomonian, Mott-Hubbard transition in finite 1d and 2d lattices, Workshop on Strong Electron Correlations, Preprint IC/96/277, ICTP, Miramare-Trieste, Italy (1996). 68. A. N. Kocharian, A. K. Jermakian, C. Yang, The superconductivity of two holes near half-filling in attractive Hubbard model. -International Conference on Strongly Correlated Electron Systems, Zurich, Switzerland (1996). 69. G. W. Fernando, A. N. Kocharian, Stoner criterion of ferromagnetism and moment saturation in the Hubbard model with applied magnetic field. -International Conference on Strongly Correlated Electron Systems, Zurich, Switzerland (1996). 70. A. N. Kocharian, A. K. Jermakian, C. Yang, Off-diagonal superconducting correlations and Nagaoka instability in the repulsive Hubbard model. -International Conference on Strongly Correlated Electron Systems, Zurich, Switzerland (1996). 71. A. N. Kocharian, A. K. Jermakian, C. Yang, Mott-Hubbard transition in finite Hubbard lattices: exact results. -International Conference on Strongly Correlated Electron Systems, Zurich, Switzerland (1996). 72. A. N. Kocharian, The behavior of the critical field and correlation functions in finite-size Hubbard-like models. –International Conference on Exactly Soluble Models in Statistical Mechanics: Historical Perspectives and Current Status, Northeastern University, Boston, MA (1996). 73. A. N. Kocharian, The quantum instabilities and electron correlations. -Proceedings of International conference on Quantum Mechanics from Microcosm to Macrocosm, University of Albany, NY (1996). 74. T. Apostolova, G. W. Fernando, A. N. Kocharian, Magnetism and related energetics of iron nitrides, APS March Meeting, Bulletin of APS, v 41, No. 1, p 434, St. Louis, MI (1996). 75. A. N. Kocharian, J. L. Sebold, Unsaturated ferromagnetism of two component Hubbard rings in a strong magnetic field, APS March Meeting, Bulletin of APS, v 41, No. 1, p 588, St. Louis, MI (1996). 76. A. N. Kocharian, A. S. Sogomonian, The study of overturned spins in two-dimensional Heisenberg model, APS March Meeting, Bulletin of APS, v 41, No. 1, p. 279, St. Louis, MI (1996). 77. A. N. Kocharian, J. H. Sebold, Unsaturated ferromagnetism in Hubbard-like finite chains at strong magnetic field, APS March Meeting, Bulletin of APS, v 41, No. 1, p. 695, St. Louis, MI (1996). 78. A. N. Kocharian, A. S. Sogomonian, Phase diagram and correlation function decay of bipolorons in 2D lattices, Physica B 174-196, 445-446 (1994). 79. A. N. Kocharian and G. R. Reich, The bipolaron superconductivity in two-band model with strong attraction, International Workshop on High Temperature Superconductivity, Miami, Florida (1995). 80. A. N. Kochariana and G. R. Reich, Orbital magnetism and mixed valence state, APS March Meeting, Bulletin of APS, v 40, p 316, San Jose, CA (1995). 81. C. Yang and A. N. Kocharian, High temperature superconductivity in the generalized negative U Hubbard model, Report on 1994 International Conference on Electronic Materials (IUMRS-ICEM'94), Hsinchu, Taiwan (1994). 82. A. N. Kocharian and G. R. Reich, The phase diagram in a degenerate generalized Hubbard model, Report on the 71 Statistical Mechanics Meeting. The title is published in the journal of Statistical Physics, ed. by Joel L. Lebowitz, Rutgers, New Jersey (1994). 83. A. N. Kocharian and G. R. Reich, The phase diagram in a degenerate generalized Hubbard model, Report on the 71 Statistical Mechanics Meeting. The title is published in the journal of Statistical Physics, ed. by Joel L. Lebowitz, Rutgers, New Jersey (1994). 84. A. N. Kocharian and G. R. Reich, Two-particle correlation in finite low-dimensional lattices, Report on International Conference on Strongly Correlated Electrons, Amsterdam, The Netherlands (1994). 85. A. N. Kocharian and G. R. Reich, Phase transition in generalized Hubbard model, Report on "International Conference on Strongly Correlated Electrons", Amsterdam, The Netherlands (1994). 86. A. N. Kocharian and A. G. Sogomonian - "Correlation decay in low-dimensional spin-glasses", Report on 6-th Joint MMM-Intermag Conference, Albuquerque, New Mexico (1994). 87. A. N. Kocharian and G. R. Reich, Mixed valence in a generalized Hubbard model, Report on 6-th Joint MMM-Intermag Conference, Albuquerque, New Mexico (1994). 88. A. N. Kocharian and A. G. Sogomonian "Phase diagram and correlation function decay of bipolarons in 2d lattices" The 20-th International Conference on Low Temperature Physics, Conference Handbook II, pp. L9-7, Eugene, Oregon (1993). 89. A. N. Kocharian and A. S. Saakian, Valence fluctuations and phase transitions in the system of strongly interacting fermions, International Conference on Strongly Correlated Systems, Program book and abstracts, p. KT16, San Diego, California (1993). 90. A. N. Kocharian and A. G. Sogomonian, Superconducting correlation function decay in 2d degenerate Hubbard model, In Proceedings of 1993 International Workshop on Superconductivity, Hoakodate, Japan (1993). 91. A. N. Kocharian and P. S. Ovnanian, Charge fluctuations and superconductivity in the Hubbard model with attraction, In Progress of High Temperature Superconductivity, v. 32, pp. 384-389, ed. A. A. Aronov, A. I. Larkin, V. S. Lutovinov, World Scientific, Singapore, New-Jersey, London, Hong Kong (1992). 92. A. N. Kocharian and A. S. Saakian, Two-particle correlations in 1d finite lattice Hubbard model, In Proceedings of 27-th Conference on Low Temperature Physics, part 2, p. 157 Kazan, Russia (1992). 93. A. N. Kocharian and A. G. Sogomonian, High Tc superconductivity and valence fluctuations in generalized negative U Hubbard model, In Proceedings of 1992 Annual Material Research Society Meeting, p. 272, Boston, Massachusetts (1992). 94. A. N. Kocharian, High Tc superconductivity and mixed valence state of bipolarons, Proceedings of 4-th International Conference on "Phonon Physics" (Phonons-1992), HiTc 16, Ithaca, New York (1992). 95. A. N. Kocharian and P. S. Ovnanian, The phase diagram in strongly correlated negative U Hubbard model, In Proceedings of the 9-th International Seminar on Phase Transitions and Critical Phenomena, p. 5, Kudowa, Poland (1992). 96. A. N. Kocharian and P. S. Ovnanian, Charge fluctuations in the nonperturbative Hubbard model, Report on the International Workshop on Strongly Correlated Electron States in Condensed Media (SCESM-91), Crimea, Ukraine (1991). 97. A. N. Kocharian and P. S. Ovnanian, Electron and hole superconductivity in the model of local pairs near half-filling, Proceedings of the International Conference on Materials and Mechanisms of Superconductivity, p. 14 (PO-30), Kanazava, Japan (1991). 98. A. N. Kocharian and P. S. Ovnanian, Charge fluctuations and superconductivity in the nonperturbative effective Hubbard model, Materials of the International Conference on "HTSC and Localization Phenomena, p. T 17, Moscow, Russia (1991). 99. A. N. Kocharian and P. S. Ovnanian, Charge fluctuations and superconductivity of highly correlated electrons, Proceedings of the 25-th AMPERE Congress, pp. 295-296, Stuttgart, Germany (1990). 100. A. N. Kocharian and P. S. Ovnanian, Strongly correlated electrons and superconductivity of diholons and didoublons, The Second Soviet-German Joint Seminar on Cooperative Phenomena in Many-Body Systems in Physics, Moscow, Russia (1989). 101. A. N. Kocharian and P. S. Ovnanian, Superexchange mechanism and superconductivity in the Hubbard model with attraction, Proceedings of the 19-th Annual International Symposium on Electron Structure of Solids, p. 6, Holzhau, Germany (1989). 102. A. N. Kocharian and P. S. Ovnanian, Phonon induced superexchange and superconductivity of diholons and didoublons in HTSC, Proceedings of the Third International Conference on Phonon Physics, p. 81, Heidelberg, Germany (1989). 103. A. N. Kocharian, Magnetic susceptibility of variable valence rare-earth compounds for the N-fold degenerate Anderson model, In Proceedings of the 24-th Congress on Magnetic Resonance and Related Phenomena (AMPERE - 88), pp. 977-982, Poznan, Poland (1988). 104. V. E. Adamian, A. A. Artsruni, A. Benayssa, A. N. Kocharian and M. A. Melikian, The influence of certain parameters on the magnetic properties of multi-component solid solutions with a CsCl structure, Report in Proceedings of the 24-th International Congress on "Magnetic Resonance and Related Phenomena", (AMPERE - 88), pp. 983-989, Poznan, Poland (1988). 105. A. N. Kocharian, The effect of electron-phonon interaction on the electron spectrum of the weakly disordered semiconductors, Proceedings of the International Conference on Phonon Physics ("Phonon-85"), pp. 217-220, Budapest, Hungary (1985).